The CTA will soon begin testing DesignLine’s ECOSaver IV, an innovative hybrid electric bus that boasts nearly double the fuel efficiency of a typical hybrid bus. The bus, which is being loaned to CTA for a period of three weeks, will operate in service on the #8 Halsted route beginning this Thursday. The ECOSaver IV demonstrator at Halsted and Taylor working route #8 Halsted on June 20, 2008. Photo by Alan Nicholls. The ECOSaver IV contains no diesel engine and instead uses a small turbine engine to charge batteries that power the bus. The turbine engine operates only when the batteries run low and require recharging. As the turbine engine requires significantly less fuel than a traditional diesel engine, the buses are able to achieve between 7 to 8 miles per gallon. 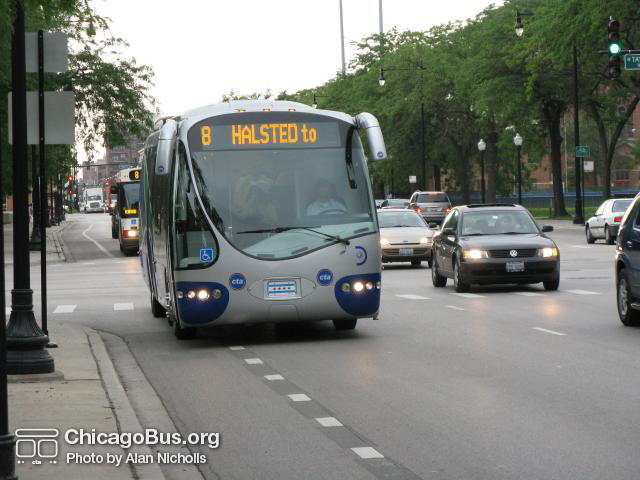 CTA’s current 40-foot hybrid buses average just 3.95 mpg. The newest 1000-series diesel buses average 3.28 mpg. Fuel efficiencies are also achieved as a result of the weight of the bus, which is up to 6,000 pounds lighter than most buses. This weight savings is attributed to the use of aluminum composite materials rather than traditional stainless steel. The propulsion technology also allows the bus to operate at significantly quieter levels than traditional diesel buses. With the turbine running, the ECOSaver IV is 70% quieter at the curb and 100% quieter inside the bus. DesignLine offers the ECOSaver IV in lengths of up to 40-feet, with a maximum seating capacity of 42. The demonstrator being tested by CTA is a 35-foot model. The CTA says it would need to negotiate creative financing deals to acquire the buses, which cost approximately $580,000 each. CTA’s current 40-foot hybrids cost approximately $570,000 each and a regular diesel bus cost between $350,000 and $375,000 each. Within the next year, the CTA plans on testing bio-diesel, compressed natural gas, and hydrogen fuel cell buses. The CTA previously tested three hydrogen fuel cell buses in 1997.